Big and Tall has been looking at ancient construction the last few weeks–we’ll switch this week from playing archaeologists to thinking more like engineers without higher math. But for the moment, we’re thinking like builders without a lot of lifting capacity. Each week I’ve been giving two questions for students to respond to–one of them a more or less traditional academic question, the other a sketch problem. I’m a big believer in finding ways to let a range of learning styles show their stuff, and I’ve learned the hard way that what makes a smart designer doesn’t necessarily make a smart writer. So the sketch problem is designed to put you in whatever the ancient Egyptian, or Roman, or Gothic, etc., etc., equivalent of a studio desk might be, and to figure out how to solve a construction or design problem with only the tools available then. So, last week’s sketch question? Take the Basilica of Maxentius, or the Pantheon, or the Aya Sophia, and come up with an efficient way to scaffold the roof. Timber’s scarce in all three eras/locations, so find a way to do it that minimizes the amount of wood you’d need. We’d talked about the fact that neither the Pantheon nor the Aya Sophia could take hoop stresses–the cracks at the former’s base and the windows around the perimeter of the latter show that–and I suggested that might be a clue as to how you could scaffold an ancient dome. Several students realized that this meant the scaffold wouldn’t have to form the whole dome at once–if the dome was going to behave like a series of radial arches, it could be built like a series of radial arches. So this scheme for the Pantheon and the Aya Sophia both suggested wedge- or strip-shaped scaffolding that could be used for form a segment of the dome, dropped slightly, and rotated to the next position. More difficult? 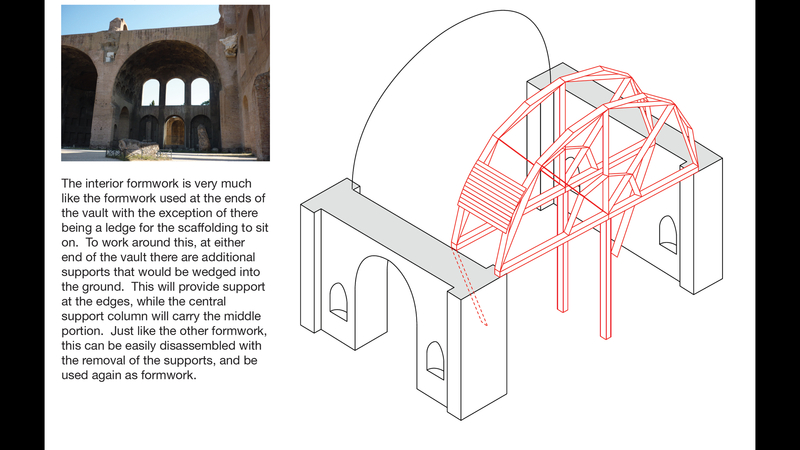 How to build groin vaults like the Basilica of Maxentius. Here, you’d have to build each vault completely, and the best you could probably have done was to build a bay at a time of timber, form the vaults, knock them down, and move them to the next bay. We agreed that the kickers here would probably have been supplemented by a pretty hefty network of ropes and cranes–otherwise it would have been a pretty big splat when the centering came down. In all of these, the idea is that the form of the building and its structural behavior are intimately linked to how the building was put together. Every structure has to be stable not only when its being built, but also while it’s being built, and sometimes the construction is the most fragile phase of a building’s existence. …you know, the usual itinerary for an 80 minute class. The default ‘textbook’ for “Big and Tall” is Bill Addis’ Building: 3000 Years of Design, Engineering, and Architecture. Bill’s 2007 book was epically deflating–it’s the brilliant, all-inclusive history of construction that many of us wish we’d written, and while it’s left a bit of room for a history of architecture and engineering, it’s the must-read general history of the subject. And it’s about 95% right on. “…in a dome made from a homogeneous material, tensions stresses, called hoop stresses by analogy with the metal hoops used in wooden barrels, are able to develop. The magnitude of these hoop stresses depends on the total weight of material above, and can be reduced by making the dome as light as possible. All correct, except that the Pantheon’s dome doesn’t have a chance to develop those hoop stresses, since it’s famously cracked along its meridians. These have been plastered over so as not to offend the delicate sensibilities of tourists, but they’re there–and said to be wide enough to fit a hand through. 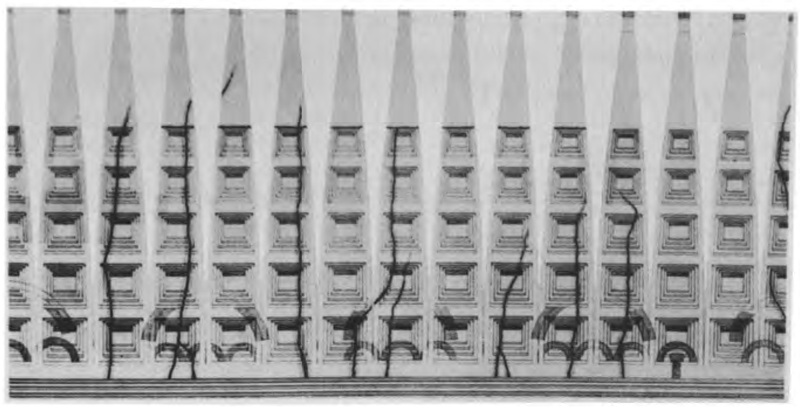 To Robert Mark, these cracks show that the Pantheon works less like a dome that can develop compressive stresses along longitudinal lines and tension stresses along latitudinal ones and more like a series of radially-splayed arches that are statically independent of one another and that rely entirely on the buttressing of the thick, heavy wall below–and the dead weight of the roof’s stepped rings–to resist splaying (Robert Mark and Paul Hutchinson, “On the Structure of the Roman Pantheon,” The Art Bulletin, Vol. 68, No. 1 (Mar., 1986), pp. 24-34.) Mark further hints that Roman builders wouldn’t have had any idea whatsoever that concrete might be able to take tensile forces, since no other building material they’d worked with would have suggested this. All Apollodorus, or whomever was the Pantheon’s lead builder, would have had to base the dome’s design upon would have been the barrel vaults that had become common for structures such as the Colosseum or the Theater of Marcellus. 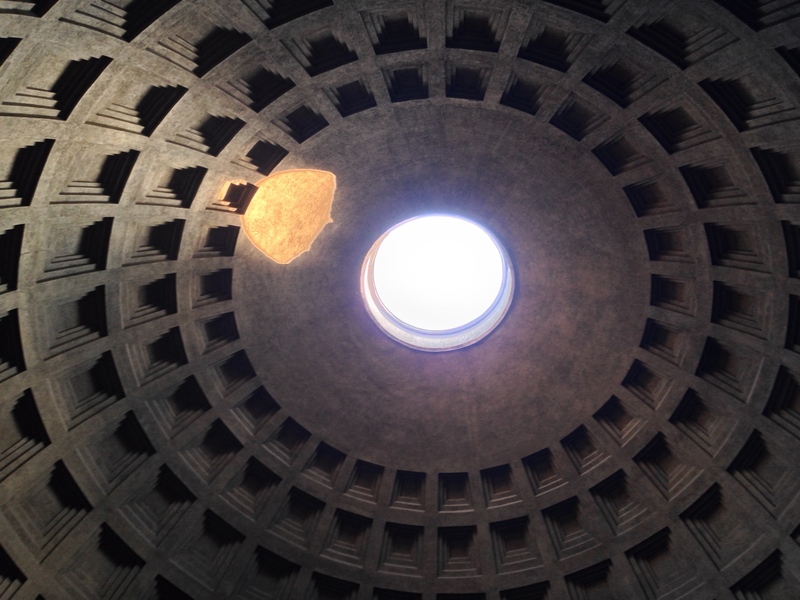 The Pantheon simply blew this principle up several times, rotated it, and like many Roman buildings simply used brute force–or, in this case, weight–to ensure stability. 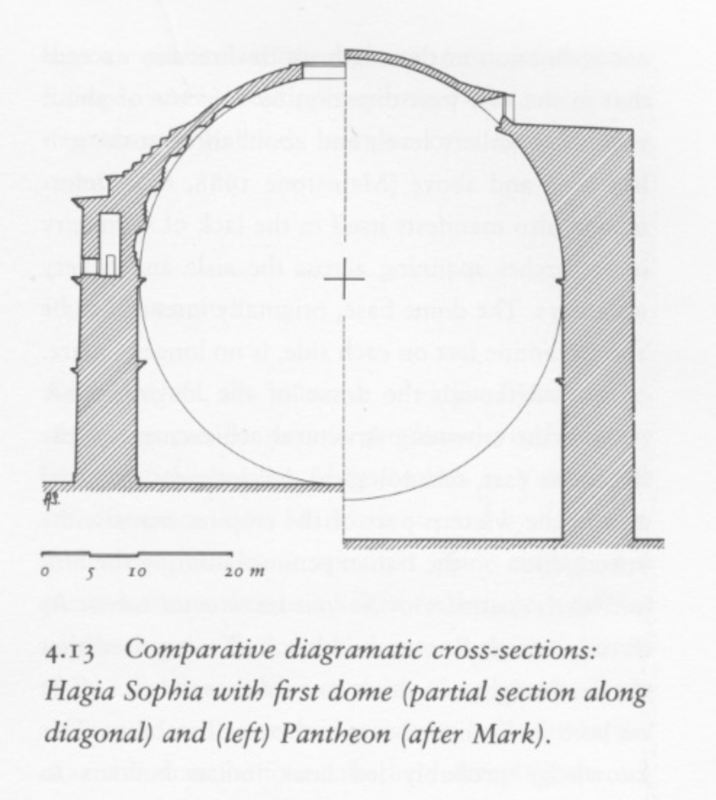 In Mark’s classic 1990 book Light, Wind, and Structure, he took this idea further, pointing out that the sections of the Hagia Sophia and the Pantheon are analogous in that they both support the thrusts of a relatively thin dome with massive buttressing–though in the case of the Hagia Sophia this buttressing takes the form of transverse shear walls and (gorgeous) semi-domes instead of a massive circular wall. But more interestingly, he suggests that the windows at the base of the Hagia Sophia’s dome occur at roughly 50° from horizontal–about where stresses in a dome begin to create bursting. This is about where the Pantheon’s cracks begin, and Mark proposes that the windows are both a way to stave off disturbing (though ultimately just aesthetic) cracking. They may, of course, also represented Isidorus and Anthemius’ understanding of the “dome” as a series of independent, radially-arranged arches. Part of “Big and Tall” is trying to understand not just how historic buildings work, but how their designers and builders thought they would work. So this is a paradigm example–instead of analysis showing how the Hagia Sophia’s dome stands up, it’s important to think about what it’s designers knew, what they didn’t know, and what they assumed. 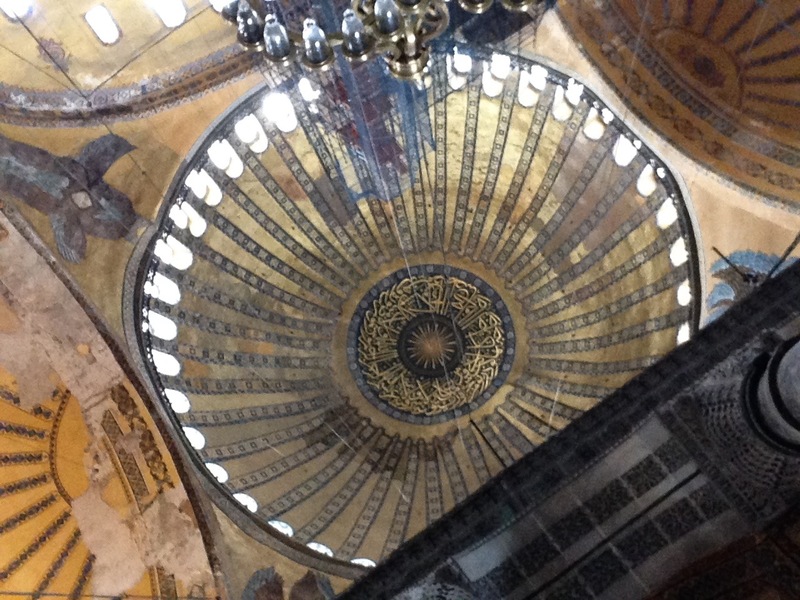 The “audacious” windows that to modern eyes look like they occur right where the hoop stresses in the Hagia Sophia’s dome would be greatest are actually perfectly placed if all you know about masonry domes is that they can only stand if you treat them like arches. And, as a result, you would possibly think of replacing the Pantheon’s cracks with openings that let light in in the most dramatic position possible, leading observers to remark on its “terrifying” stability and to assume that it was held up only by “a golden strand from heaven.” Which, I can’t help but think, is a pretty great spec. Other sponsors include Design Corps and AIA Iowa. For the first time in about six years my turn has come around to teach an elective, and I couldn’t be happier to be teaching Big and Tall: History of Construction from the Pyramids to the Burj. It’s exciting–and somewhat terrifying–to be pulling together a new course and to try to cram everything into 15 weeks, but it’s also a ton of fun. These first couple of weeks are a mad dash through ancient building–as much about me playing archaeologist as anything else. The point I’ll be trying to make, like virtually everything else I teach, is that designers of all stripes have aspirations they’re trying to meet, and an inevitably limited palette of resources with which to meet them. Doesn’t matter if you’re a high-tech architect in the 21st century or a master builder in 1600 BCE. Either way you’re being paid to perform an intricate balancing act between what Aristotle thought of as material and final causation. So, Egypt? Plenty of good stone, lots of labor, not so much timber. The Pyramids or Karnak are pretty much what you get, since stone is good at holding things up, but not so good at spanning long distances. Once you have a few hundred strengthy laborers on site you can set them going with a few tasks and not much supervision–cut this stone to size, drag it to the site from the quarry, raise it into place, and have a mason do the final dressing. Do that for 15 or twenty years and you get Giza. We don’t know, of course, how exactly this got done, but the fun part about going back this far is that plenty of folks have spent time trying to figure these things out. 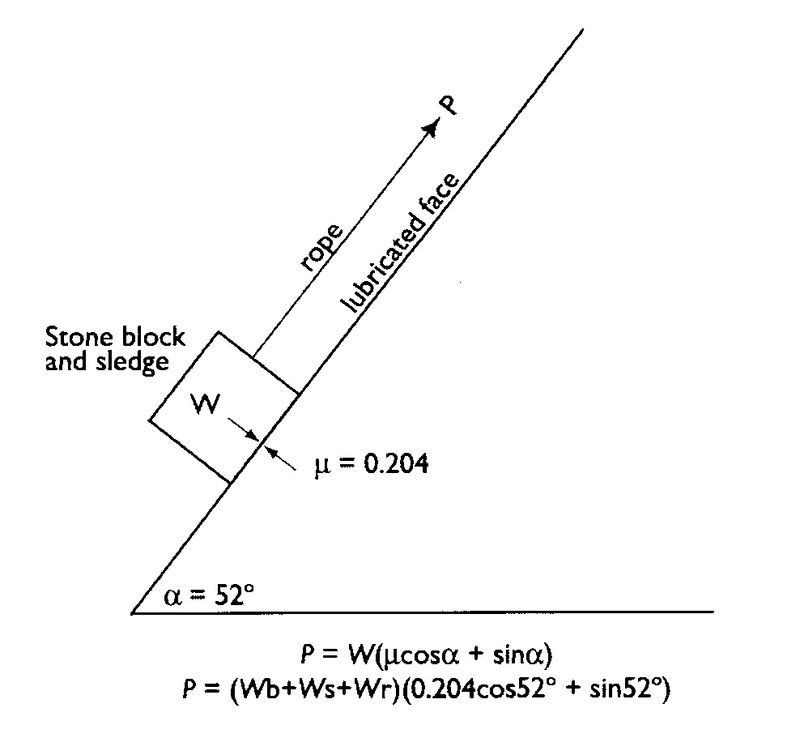 So, for example, how do you pull a 2.5 ton stone to the top of a growing pyramid? Build ramps? Rock them into place layer by layer? James Frederick Edwards, “Building the Great Pyramid: Probable Construction Methods Employed at Giza.” Technology and Culture, Vol. 44, No. 2 (Apr., 2003), p. 347. Petroski, in a subsequent column for American Scientist, added what I think is a brilliant possibility to the math. While a gang of 50 workers could have pulled such a weight up the 52° incline, what if that gang of workers also served as a counterweight? In other words, what if the Egyptians sequenced the construction so that one gang pulled while one gang headed down the other side of the Pyramid, attached to the end of the rope pulling the next sledge? 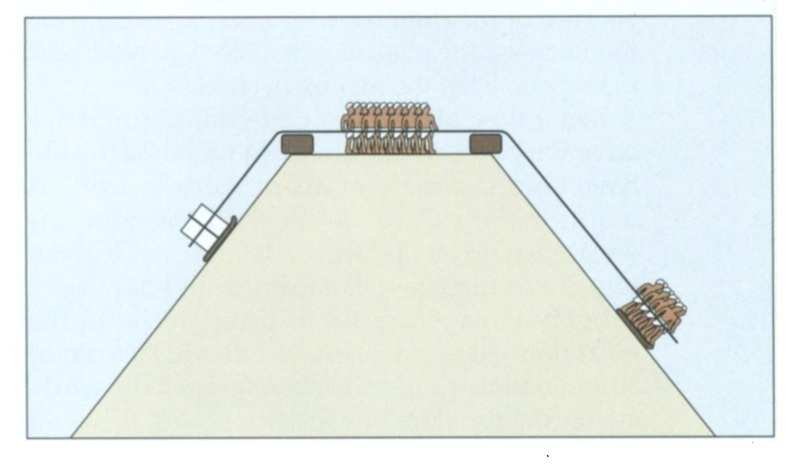 Henry Petroski, “Engineering: Pyramids as Inclined Planes.” American Scientist, 92: 3, May-June, 2004. 221. What I like best about this solution (aside from the fact that I get to introduce students to Petroski, a brilliant historian of engineering), is that it suggests that the resources available to the Egyptians weren’t immediately obvious. Sure, 10,000 workers can pull a lot of stone, but they also offer a considerable amount of actual weight, which is also useful. Especially if you don’t have very much else. Whether the Egyptians were clever enough to realize this or not (and, remember, they hadn’t really figured out the wheel or pulleys yet), this is the kind of thinking that reveals a lot about why buildings are the way they are. The pyramid may have been a sacred symbol, but one of the reasons the Pyramids were built, instead of the Cubes or the Dodecahedrons, may well be that the pyramidal form offered a clever way to build itself. Fun stuff. More to come. You are currently viewing the archives for January, 2015 at architecturefarm.